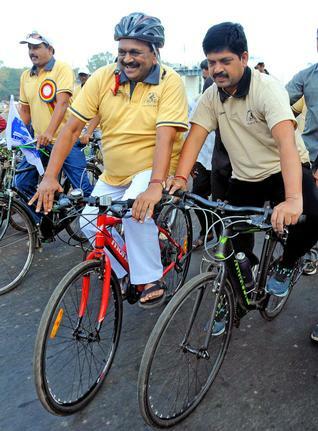 BC Welfare and Excise Minister Kollu Ravindra on Sunday said that a proposal was made to Chief Minister N. Chandrababu Naidu on allotting space for cyclists on roads in the capital city at Amaravati. Speaking after flagging off a 32-km Amaravati cycle rally organised by Aqua Devils Welfare Association near Prakasam Barrage, he said cycling was the best exercise to keep away several ailments and the world was shifting to cycling in a big way to stay fit. “Sedentary lifestyle is taking a heavy toll on youngsters and cycling is the best cure,” he added. Andhra Cricket Association General Secretary Gokaraju Ganga Raju appreciated the association, known for promoting long-distance swimming among denizens for over 15 years, for organising the cycle rally for the third consecutive year. “As many as 200 cyclists along with villagers of the surrounding hamlets of the capital city took part in the rally, aimed to generating awareness on environment protection,” said association president Ramachandra Rao. The rally passed through Undavalli, Penumaka, Krishnayyapalem, Mandadam, Velagapudi, Uddandarayunipalem and entered Amaravati. It reached Manthena Satyanarayana Raju Ashram, CM’s residence and later culminated at the association premises. All the participants were given a certificate by the organisers.